I am an Associate Professor in the Games Academy at Falmouth University. I work in the MetaMakers Institute and the Digital Creativity Labs, researching computational creativity and artificial intelligence for games. I teach on the BSc Computing for Games degree course, as well as contributing to Falmouth's other games courses. Currently I lead modules on Principles of Computing, Artificial Intelligence, Legacy Game Systems, and Research Practice. If I had spare time, I would spend it being an independent game developer and AI consultant. 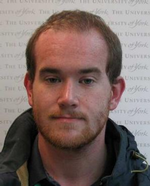 From 2010 to 2013 I was a postdoctoral research associate in the Department of Computer Science and the York Centre for Complex Systems Analysis at the University of York. My research was on artificial intelligence for games, specifically Monte Carlo Tree Search for games with uncertainty and hidden information. I worked with Peter Cowling and Daniel Whitehouse on the EPSRC-funded "UCT for Games and Beyond" project. My Google Scholar profile. My ResearchGate profile. Wevva — make games directly on your iPhone in minutes, no programming experience required! MCTS demo application — play several games (including Connect 4 and Draughts/Checkers) against an MCTS opponent. Requires Microsoft Windows and .NET framework version 4. Multi-armed bandit demo, and the same demo with UCB1. Sample MCTS implementation in Python. AI Factory Spades for Android.